Geneva is built around the lake. A bridge allows you to cross it, but to enjoy the lake from the water, I recommend you hop aboard the “Mouettes genevoises” (transl. Genevian Gulls). These little yellow shuttle boats are included in the regular bus ticket (for an even cheaper one-way ticket, choose “Saut de puce”). From 08:00 to 19:00, the Mouettes commute between 5 stops around the lake (Tip: The stop “Pâquis” is the closest public transportation stop to the Bains des Pâquis.”). The original Mouettes are yellow. I adore looking at them, navigating between the blue of the lake and the sky! For me, they are the most peaceful image of Geneva. 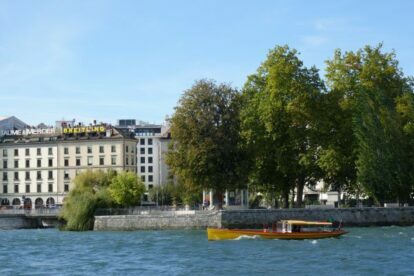 For me, a photo with a Mouette-boat, the Fountain and the Bains des Pâquis makes up the most typical picture of Geneva!! During the summer, you will love feeling the refreshing Fountain’s drizzle on your skin if you take the line M2 from or to “Eaux-Vives” stop. During the autumn or the winter, taking the Mouettes with foggy weather is just magic!